Each Friday, in partnership with Montana Wilderness Association we will feature a new western Montana trail and then give one lucky listener some cool goodies to help them embark on their journey! With panoramic views into Idaho, this trail passes through dry forest, talus slopes and berry patches on the way to two alpine lakes stocked with healthy brook trout populations! Directions: From Missoula, head west on I-90 and take the Superior exit. Take the first three lefts until you’re on Diamond Road – and then proceed 1.1 miles and turn right onto Cedar Creek Road, #320. Continue down the primarily gravel Cedar Creek Road another 24 miles until you reach Cascade Pass and the trailhead. What to expect: The trail begins on the Stateline Trail #738 then connects to Bonanza Gulch Trail #616 and on to Cascade Pass, where it intersects with Cedar Creek Road. Head north on the Stateline Trail and after a while you will pass several good huckleberry fields. If the timing is right, you can snack on berries while enjoying the expansive views into Idaho! At 1.4 miles, look for a marker that directs you over the ridge to drop down on the Montana side on Trail #616. 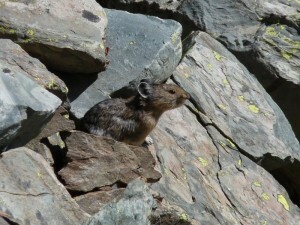 You will pass more talus with the occasional chirp of a pika. At about 2.1 miles you will be treated to a great view of lower Bonanza Lake. You’ll reach the lake at 2.3 miles after going left on Trail #106. After pausing here, climb over a small ridge and trek another 2.6 miles to Upper Bonanza Lake. Tip: Dispersed campsites are available at both lakes.